Whether it is starting your own woodworking business or construction firm, or even if you are just one of those people who have mastered only miter saws and need a replacement for your old product, the first option on your list should be the Hitachi C12FDH. 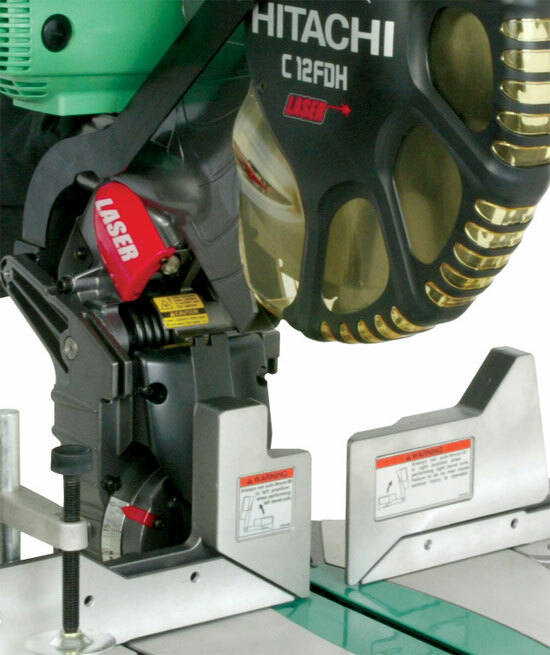 In addition to outstanding functionality, this saw packs adequate accessibility and comfort features that add to its appeal. Quality :With a 15-amp motor that can produce 1,950 watts of output power, quality is no small thing with this Hitachi marvel. Every feature is designed to suit the user, adding to the ‘thoughtfulness’ that went into the saw’s design. Usability :So much of what the Hitachi C12FDH is hidden behind the neat metal outer cover. One of its many features is a micro-adjustment knob for fine-tuning. Performance : A laser component precisely indicates point of cutting, allowing you to adjust the wood to get that perfect cut. The Hitachi C12FDH can power through hardwoods. Robustness: Most of the machine is made of steel, enhancing durability and strength. The handles are made of an elastomeric compound, a chemical coat that makes them shock proof and slip resistant. It is designed with a 5-1/8” tall pivoting fence made of aluminium. One of its best features is the Laser Marker system that perfectly and precisely delineates where the blade is going to perform the cut on the material used. This saves time and resources while eliminating risk. The laser system and therefore the material’s position can easily be adjusted to the left or right of the mark as you choose. The laser itself can be adjusted with the help of a handy knob. Imparting excellence through convenience, the device makes allowances to cut crown moulding vertically. The handle is made of an elastomeric compound that prevents slippage while making it shock resistant to the vibrations given off by the saw as it performs. The machine is capable of producing 1,950 watts of output power using its 15-amp motor. This renders the device capable of running at 4000 rpm without a load. This is more than enough power for it to cut through hardwoods. It has a 48-degree bevel angle range on both sides. You can make use of the micro-adjustment knob for fine-tuning. The saw’s table has 52-degree allowances on both sides. The blade is a TTC 32-tooth saw blade. The Hitachi C12FDH 15 Amp 12-Inch Dual Bevel Miter Saw with Laser packs so many features and valuable components that its practicality is top notch. In addition to all the above specs, you also get a box wrench, holder assembly, dust bag, and hex bar wrench. vy-duty performance is equal parts accurate and efficient, especially when it comes to cutting. Lauded to be better than a Delta compound miter saw, this device performs outstanding molding jobs. Its smooth cut functionality has given some customers the ability to finally install those perfect laminate floors they have always wanted. 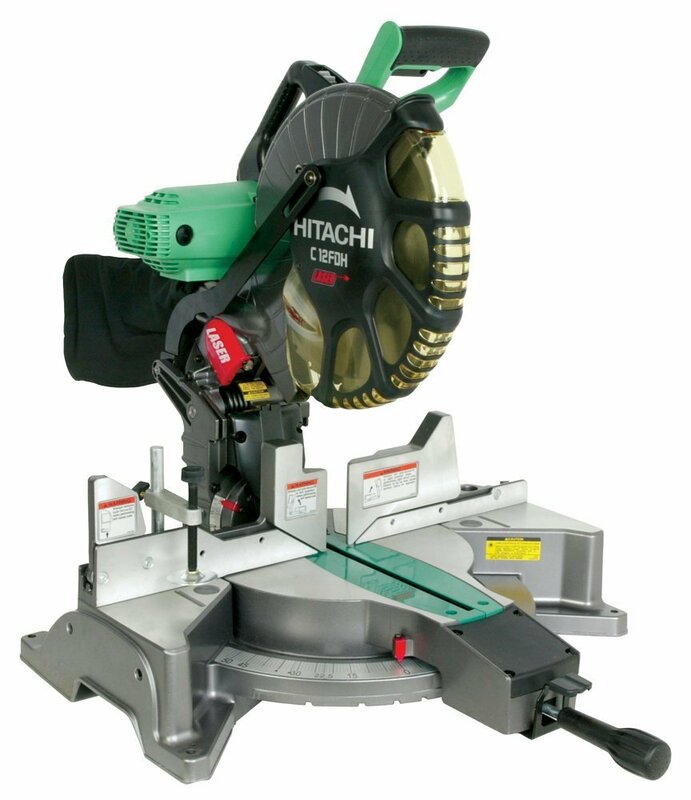 The Hitachi C12FDH’s has consistently been observed to outdo most other miter saws in the same product type and range. Even customers who purchased this saw as a re-conditioned model commented on its ‘fresh’ look and excellent performance. Quite easy to assemble right out of the box, and easier still to understand, the user vote has declared ‘yes’ to the incredibly manoeuvrable Hitachi C12FDH. A majority of the Hitachi C12FDH’s features are crafted to impart precision. Essentially a chain-operated machine, it gives off very little noise for something this powerful. Equipped with both a large TTC 32-tooth saw blade and a sturdy motor, you can imagine that the Hitachi C12FDH will be heavy. Strangely, this is not the case. The whole device falls under 60 pounds. The technical service department of the manufacturer can be quite hard to get hold of, seeing as how they have their headquarters overseas. Why the tech people? Because some usage and accessibility features, let alone specific troubleshooting points, can be hard to understand and change on your own. The manual is lax when it comes to details and the internet’s best advice is to contact the Hitachi C12FDH’s tech support. From its thumb-actuated positive miter and outstanding all-round angle adjustments to its excellence with crown moulding tasks and heavy-duty cutting projects (2 to 5/16” high and 5 to 21/32” deep), the Hitachi C12FDH 15 Amp 12-Inch Dual Bevel Laser Miter Saw has our stamp of approval. The 12” TCT saw blade makes short work of most heavy tasks (drilling, fastening, wood- and metal-work, concrete, and cutting) and its Marker system (Laser enabled) makes predictable blade placement a cost-saving dream come true. A no-load speed of about 4,000 rpm is highly attractive. We love its industry-leading five-year warranty and accessories that come with the product package. As power tools go, the Hitachi C12FDH is making waves. It is ideal in every way, packs a plethora of practical features, and comes equipped to handle several different kinds of tasks efficiently and over several hours. Comparing its quality, robustness, usability, and features with price, it is safe to say that this wonder machine is being sold quite cheap for all the good it can do for your business or hobby. Flexibility, accuracy, safety, and excellence are some of the words we would like to use to summarize the Hitachi C12FDH. Its performance is top notch and as power tools go this one works magic on your projects. Of course, a technical mind needs to be behind the handle and nothing a little practice will not solve. Overall, this miter saw product is designed to make your projects easier to complete, as all its features and components will show.